Dreaming of a White Christmas? Well it happened. This may not sound too exciting to some, but where I live it usually doesn't snow. And today, it snowed. I felt like I was somewhere else. It made me think of home. Even though my birthplace is about 5000 miles away, I didn't feel as melancholy as before, it’s because I’m not alone, and that made me feel at home. Merry Christmas indeed, to you! 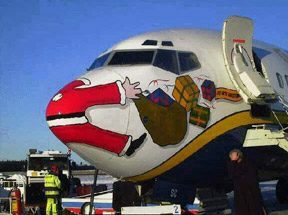 An airline pilot spotted Santa! A new vaccine called NicVax has recently been developed by Florida-based Nabi Biopharmaceuticals. The vaccine is used as a nicotine blocker to prevent and treat nicotine addiction. A clinical trial, held in both the US and the Netherlands, said that injections were safe and well tolerated. Now a Dutch organization STIVORO would like the Dutch government to add this vaccine to their vaccine program so it can be given to children as young as 9 years old. Recently the lacks attitude of the police has become more apparent to me. I'm just wondering what the deal is, what has caused our police force to become less vigilante towards "common" crimes. People can get off either due to the lack of evidence or simply due to the commonness of the indicent itself. I can understand the frustration of some police officers, trying to work within the limits of the law and trying to prove your case in court. Although I believe some officers have given up. Too many crimes, disappointments, more of the same. Unfortunatly some cities don't have that "Small Town Sheriff" feel to it, where the Sheriff knows everyones name and has everything under control. Even though "them City Boys" will beat him with experience any day.